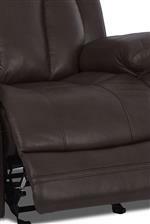 Head to toe comfort, this gliding reclining chair can be your place to relax after a long day. This chair is fitted with a fully padded chaise footrest that extends with the simple pull of a handle. 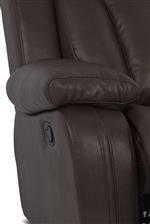 The gliding base allows you to move gently back and forth for a relaxing sit. 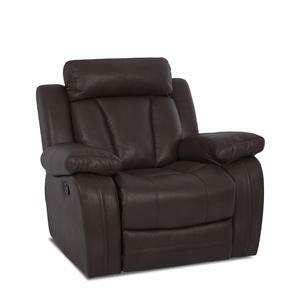 The Atticus-US Casual Gliding Recliner Chair by Klaussner International at Powell's Furniture and Mattress in the Fredericksburg, Richmond, Charlottesville, Virginia and Maryland area. Product availability may vary. Contact us for the most current availability on this product. Fabric Options Available as shown in select options. Base Description Hidden reclining bases. Recliner Mechanism Manual and power reclining mechanisms featured throughout collection. 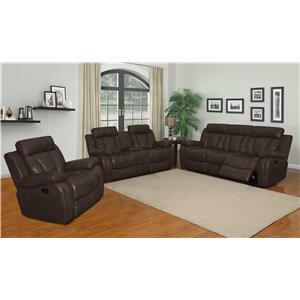 This casual motion collection provides you with the ability to add comfortable seating to your living room or family room. 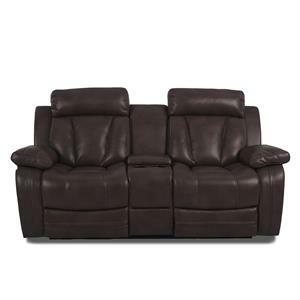 These pieces feature fully padded chaise seating, the option for power recline, console storage and cup holders. 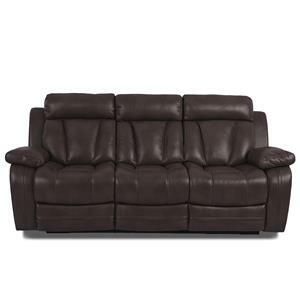 Update your home with comfortable and casual style with a piece from this reclining upholstery collection. The Atticus-US collection is a great option if you are looking for Casual furniture in the Fredericksburg, Richmond, Charlottesville, Virginia and Maryland area. Browse other items in the Atticus-US collection from Powell's Furniture and Mattress in the Fredericksburg, Richmond, Charlottesville, Virginia and Maryland area.